Six more people were confirmed dead in the country’s south, according to a new toll published on Sunday. “With the death of five people in the Khuzestan province and another person in Ilam province, the death toll has now reached 76,” since March 19, a statement by the coroner’s office said. Officials have again issued flood warnings for the east of Iran, with heavy rains that began on Saturday forecast to continue. 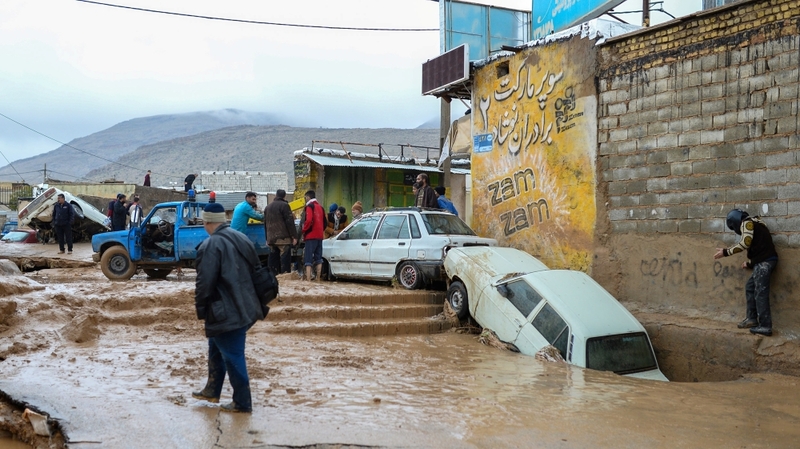 Since mid-March, flash floods have hit 25 of Iran’s 31 provinces, forcing mass evacuations, ravaging infrastructure, and inflicting heavy losses on the agricultural sector. “Twenty-five provinces and more than 4,400 villages across the country were affected by the floods,” Interior Minister Abdolreza Rahmani-Fazli told parliament, according to the official IRNA news agency. He said the damages amount to between 300 and 350 trillion rials – between $2.2bn and $2.6bn at the free market rate. “More than 14,000 kilometres of roads have been damaged,” he said, according to IRNA. The government of President Hassan Rouhani has been mounting relief efforts, enlisting the help of the cash-strapped banking system to offer help in the form of cheap or interest-free loans. Local communities are leading relief efforts, with soldiers and volunteers clearing rubble, diverting water, building dykes, and distributing supplies. “Everything that comes through these doors is donated by private citizens,” said Al Jazeera’s Zein Basravi, reporting from an aid camp in the capital, Tehran. The World Health Organization and UNICEF are also helping, as are Germany, Iraq, Kuwait, Oman, Pakistan, Russia and Turkey. But, aid workers in Iran say US sanctions are hampering their ability to help those affected. “Right now, we need some boats and machinery to control the water flow,” Fereshte Ghaffari, a volunteer for the Imam Ali society said. “It would be much easier for international agencies to provide them. Due to the sanctions, prices are [also] much higher. If it wasn’t for sanctions, [things wouldn’t be as expensive] and we could do much more with the money we’ve collected,” she told Al Jazeera.